If you frequently use different software apps or programs on your computer, you are probably not a fan of the annoying User Account Control (UAC) prompt that pops up every time you launch a program. 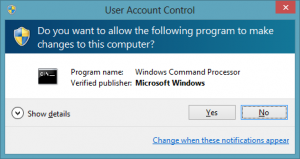 What does the User Account Control (UAC) prompt do? Windows displays the User Account Control (UAC) prompt to notify you right before an application makes changes to your PC. These changes typically require administrator level permission. While it is a good idea to let the UAC notify you whenever applications or programs try to make changes to your PC, you can change how often it notifies you or turn it off completely. 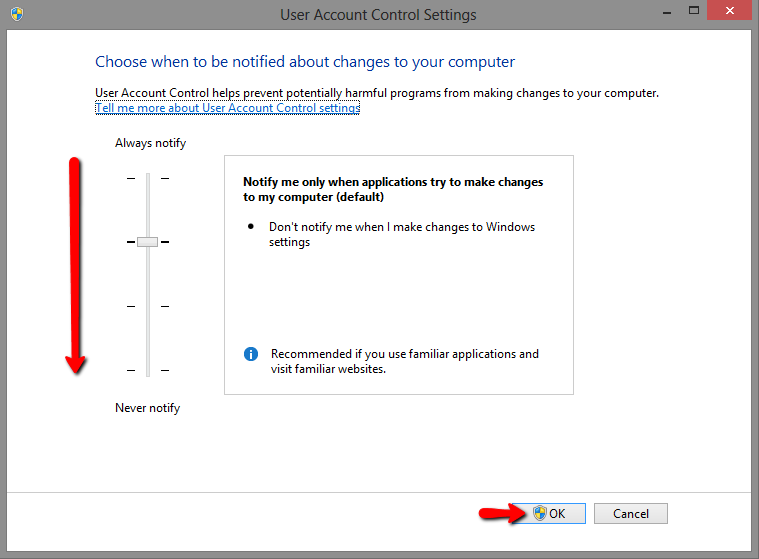 How do I change the UAC settings or turn off UAC in Windows 8 or 8.1? – Access the Search Charm on the right side of your desktop screen. If you are using Windows 8.1, you can also access this option by clicking the Start Button and selecting the Control Panel. – In the UAC Settings window that appears, simply move the vertical slider to control how often you want be notified by the UAC. Moving the slider to Never Notify would turn off UAC completely. Once you are done moving the slider, click on OK to save the changes. Simple as that. You will have no more UAC prompts getting in your way. However, we recommend that you use caution while launching programs you are not familiar with. Let us know if you have any questions by posting in the comments section below.